This arrangement was created by Carl Thomas from ukeofcarl.com and features on his ebook The Jewish Ukulele. It shouldn’t be too challenging to play if you’ve played a few chord melody arrangements before. The tab is rather kind and leaves you in first position (your index finger covering the first fret) for most of the song. One thing I like about this arrangement is the way Carl has split the first 8 bars. The first 4 bars focusing on pure melody and the second 4 bars picking the melody from the within the chords. It’s a really effective way to play and keeps the listener interested. Take it slowly, a single bar at a time and you shouldn’t have too much difficulty here. I’d recommend using a metronome on this one to really get that timing down, this kind of arrangement really benefits from meticulous timing. If you enjoyed this arrangement I’d recommend taking a look at Carl’s ebook The Jewish Ukulele. 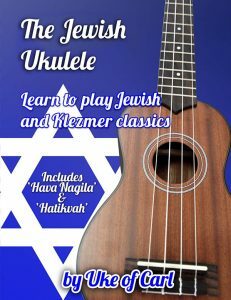 It features this and 9 other classic Jewish melodies arranged for solo ukulele. 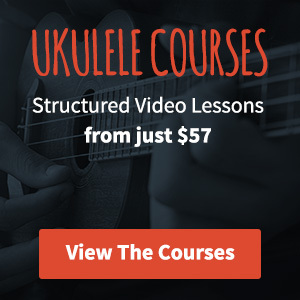 All of the arrangements have supporting MP3 files to help you learn. Very lovely and fun to play! How many beats per measure are you playing it at? Hi Ally, it’s really nice to play – I agree with you. The MP3 is clocking in at about 72BPM. I hope that helps.